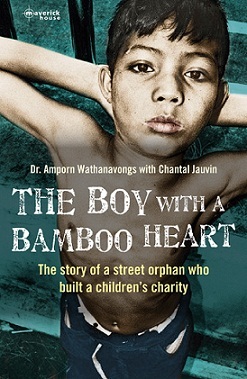 Chantal Jauvin on writing the Boy With A Bamboo Heart; the story of Dr Amporn Wathanavongs, the foster father to 50,000 poor Thai children. YOK TUGS at my hand. She wants me to walk faster. I speak no Thai, so we smile at one another. She looks into my eyes. Hers are sunken. Her skin is translucent. With a girlish laugh, she points ahead and tells me something I do not understand. Julie translates for me. “It’s her home. She has never shown it to a farang (foreigner) before.” Nun grabs my other hand and pulls me in a different direction. She also wants to show me her home. For an hour, the children march me through this Bangkok slum. Balancing on planks of rotting wood atop sprawling garbage, I am followed by a thread of faded red-and-white and blue-and-white uniforms. Bamboo poles support tin roofs. Sometimes blue tarps cover wood or broken concrete slabs mere inches above the trash. Petrified plastic bags, rusted scooter parts, broken pails, and spoiled vegetables litter the neighborhood. Before they bring the mango sticky rice for dessert, Dr. Amporn and I have agreed that I will write his life. Looking over my shoulder at Yok and Nun, who play with all the vigor of well-fed children, I know his story has to be told. After lunch that day in March of 2010, I revisited Thailand many times to perform hundreds of hours of interviews and research before the book could take shape. First, I had to find his voice. With great patience, in person and across the ocean, he shared his life with me. 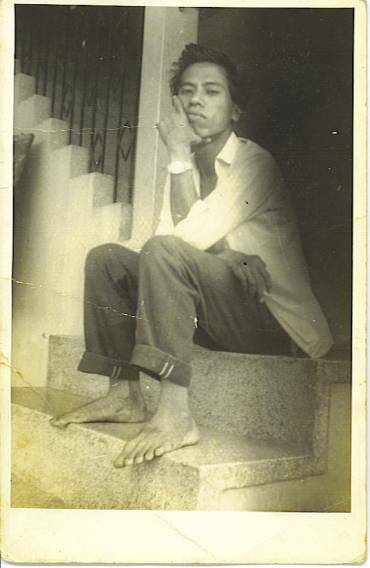 In time, he trusted me with the painful details of his years in the jungle and the joys of his relationship with Father Bonningue. He remembered, sometimes with tears, what he had long buried. His sole purpose in baring his soul, as he told me many times, is to give hope to others. My goal was to tell his story as truthfully as I could, and take the reader on the journey of his extraordinary life. Throughout my years of research and writing, his story inspired me. Where necessary, I’ve created dialogue, embellished descriptions, and filled in gaps of memory and research. Dr. A, as I affectionately have come to call him, has read the manuscript in its various incarnations. He confirms that I captured the essence of events, people, and places. Writing this book has been as much of a fortunate discovery as a challenge. I had to leave behind my prism of an educated woman brought up in modern Canada with French as a mother tongue. I had to acquire the skin of an orphan who begged for his food, carried and used a rifle as a boy, took the vows of a monk, and dedicated himself to social work. If travel provides the launchpad for discovery, writing another person’s life is nothing less than an exploration of one’s own perspectives and views. In telling this story, I hope to have successfully captured the life of a man who had the courage to survive and thrive against tremendous odds and define for himself what belonging really means.